Ahmedabad:BJP president Amit Shah today claimed that PM Narendra Modi would return to power after the next Loksabha polls with a bigger majority than that of the last election retaining all 26 seats in home-state Gujarat, increasing the earlier tally of 73 in UP and performing all time best in states like Bengal and Odisha. Inaugurating the Mera Parivar Bhajpa Parivar (My Family-BJP Family) campaign of the party, which was first among the four poll based campaigns planned to be launched before the notification of the election and in which around five crore families of BJP workers would put party flags on their houses and share its picture on social media, Shah said that in the last election BJP had got 17.5 crore votes and made a majority government. ‘This time only five crore families under this single campaign meant 20 crore party voters which was more than what we got last time and enough to ensure a majority government,’ he asserted. Shah, who also put the party flag at his Thaltej residence here to mark the beginning of the campaign said that so far more than 1 lakh have done so. He want the target to be achieved in 10 days and in Gujarat he wanted the party to surpass the target of 25 lakh. He said that the party would before the end of march organize 3 more campaigns, Sampark Abhiyan to connect more people with the party, Kamal Jyoti to observe Diwali for the freedom from the 70 years dynastic rule of Congress and a vijay Sankalp rally in which more than 3 crore motorcycles would participate across the nation on one single day. He spoke about the achievements of Modi government on the occasion saying that the Modi government has done so much in just one five year term in comparison to what the Congress governments could not do in its long rule. Shah said that the Modi ji would become the PM again with even bigger majority. He said that Modi government has not done any shameful thing due to which the workers should feel ashamed. They should go to the people proudly and tell them about the achievements of the government. The BJP president said that the Mahagathbandhan (grand-alliance) was without any leader or policy. Even jokes were doing the round on social media about who would be the PM if they come to power. ‘If each of their leaders become PM on the six days of the week with Sunday without any how could the country be run. They don’t have a leader while we have honest and popular Modi ji to lead the NDA,’ he said. 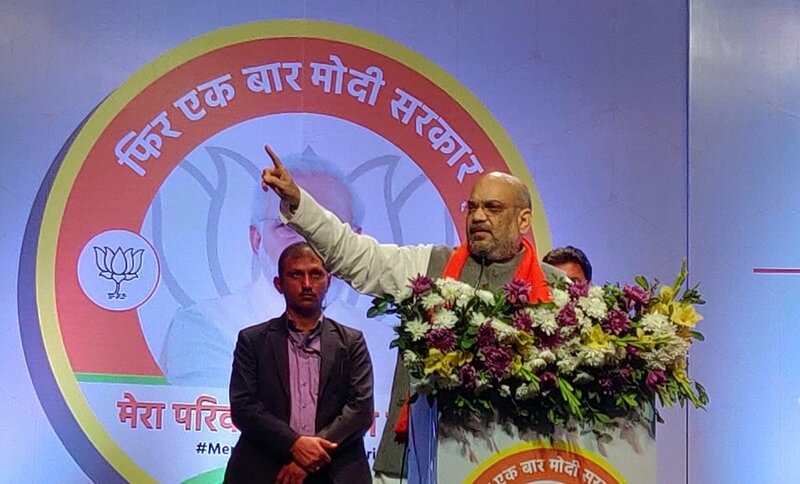 Shah said that the 2019 election would also ensure that India would become a superpower in the world. He said that during his tours across the country he felt that the people supported Modi firmly. He appealed workers and the people of Gujarat to not only ensure the victory of BJP on all 26 LS seat but also to increase the margin of victory on each of these seats than that of the last time. He also appealed the workers to through away any fear about Mahagathbandhan saying that its regional satraps won’t have any effect in other states and that the BJP had already defeated all of them on their home-turfs in last election. ‘ What Effect Devegowda ji would have on people of Gujarat or Mamata on Maharashtra or Akhilesh on Kerala. I know every nook and corner of UP and I assure you that our seats there would only go up from the existing 73. This time BJP would hold its flag high in Bengal and Odisha also. In Bengal where Mamata Didi is trying to suppress BJP, our party would win more than 23 seats. The change their was certain,’ he said. He also hit out at Congress president Rahul Gandhi for his jibe at the pro farmer announcements in the Interim budget of the Modi government. He also questioned the knowledge of Rahul Gandhi about the farmers and agricultural issues. Shah also said that the injustice against Gujarat and Gujarati leaders like Sardar patel, Morarji Desai and Modi during Congress rule has become a matter of past during the Modi government which has made a sky touching statue of unity of Sardar patel. CM Vijay Rupani, DyCM Nitin Patel, Gujarat LS poll in-charge of the party Om Mathur, state party president Jeetu Vaghani were also present on the occasion.